While the Comb of Beardmancy touches your body, you can grow and retract a foot of facial hair as a bonus action. You can also do the same to other creatures you are able to touch. The maximum you can grow and retract the facial hair of any creature is one foot. Additionally, every day the Comb of Beardmancy is in your possession your beard will grow one inch. You also gain the ability to control beards you can see within 40 feet if your beard is longer. As a bonus action, beards of at least a foot can be commanded to strangle their face hub. The meat sack connected to the beard must succeed on a strength saving throw of 10 + your charisma modifier or take 1d6 bludgeoning damage every turn until they succeed. 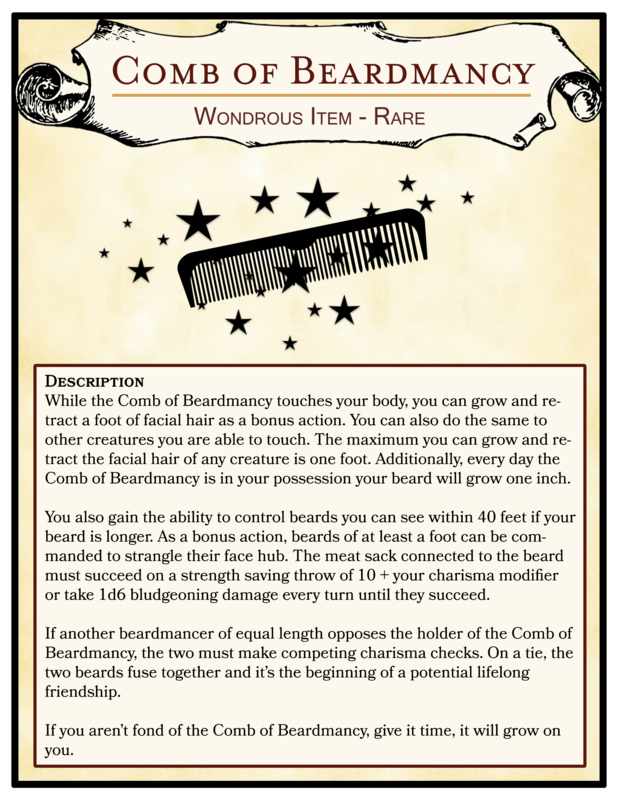 If another beardmancer of equal length opposes the holder of the Comb of Beardmancy, the two must make competing charisma checks. On a tie, the two beards fuse together and it’s the beginning of a potential lifelong friendship. If you aren’t fond of the Comb of Beardmancy, give it time, it will grow on you.